As the ALCS comes back to Toronto, I’m settling in with some snacks, a fresh beer, and that nervous excitement in my stomach in anticipation of what I’m about to witness. My Jays fandom goes back about as far as I can remember, when I would step up to a ball on a tee, pretending number 29 was stitched to my shirt, insisting my parents address me only as ‘Joe’. Tonight though, my team won’t have nearly as much of my attention. Today is something much more important than playoff baseball. Today is Election Day. I’ve been thinking about this day for a long time, and talking about this all day. In thinking about why I vote, I think of many reasons from the issues I care most about in this election, to the reasons that reflect my personal values and philosophy, and what it means as part of my identity as a Canadian. In thinking about why I vote, I think about why some people I know don’t vote, and it always seems to come back to the idea that their single vote doesn’t matter. As tempting as it might be to vigorously shame our disengaged peers, it’s probably not going to be very compelling. People don’t respond well to shaming, it turns out. It strikes me that the idea of being one in a crowd can mean two very different things to people when it comes to cheering on the Jays and casting a ballot. To me though, it’s very much the same. We rush to support our teams, huddling around our tv’s. We dream to have a seat in the stadium where we can be more than a set of eyes, more than a passionate soul, and more than a knowledgeable mind – we can be a voice. A voice that screams and groans and cheers with the fortunes of our team. We believe superstitiously in not speaking of victories, shutouts and perfect games before they conclude, lest our loose lips ruin the outcome. We are honoured to count our lone voices among the deafening din. We feel compelled to do our part. 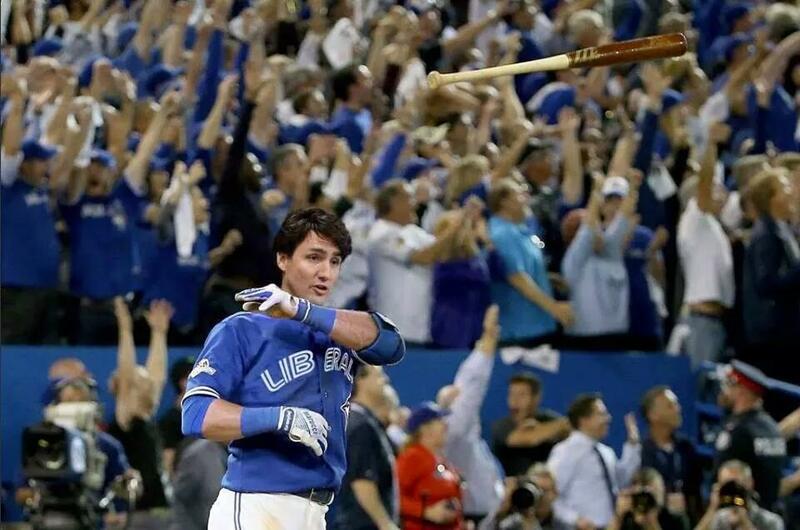 Politics, admittedly, is not nearly as captivating as the Jays’ historic return to the playoffs. There are rarely late season acquisitions, not many dramatic comebacks. There are no home runs. There are no bat flips. An election doesn’t hinge on a moment the way a game does, when we all watch the best player step up to the plate, or our closer stare down a batter with the game on the line. Elections hinge on moments more personal, more private. They’re the moments only you witness, when you sit in quiet contemplation, challenging beliefs, asking questions, engaging in passionate, emotionally driven debate with your peers. Almost all of it is private or semi private, culminated in an action shielded from view, but for the public record, anonymously; at once ephemeral and everlasting. The difference is in the effect we actually have in voting. Of course the chances of your local race coming down to a single vote is virtually zero. That always seems to be the crux of the argument – my vote doesn’t matter. I wonder, to our cynical friends, whose vote does matter? Is there a certain person or group they can point to? When a player credits the crowd for giving the team the boost they needed to pull out the win, does he single out the fans over the dugout or behind the plate? No. In the roar of the fans, our voices, regardless of what is said, are indistinguishable, but they are united by their collective presence. So it goes for our electoral voice. Even if it did come down to a single vote, we would never know whose ballot turned the tide, and that’s the way it should be. Our voice may not scream a single message, nor should it. It should only do what it can and that is to yell that we are here, and we will be heard.